President Obama told a young and supportive audience of Facebook employees not to get "frustrated" or "cynical" on Wednesday, urging them to remember that America has come out on top in the past and can do so again. "If we come together, we can solve all these problems," he said. "...Rather than be discouraged, I hope that everybody is willing to doubled own and work even harder." The president made the comments at a "town hall" meeting at Facebook headquarters in the San Francisco bay area, an event that was part of his campaign-style push for his deficit-reduction agenda. Mr. Obama jokingly introduced himself at the outset of the event as "the guy who got Mark to wear a jacket and tie," a reference to Facebook's young chief executive, Mark Zuckerberg. 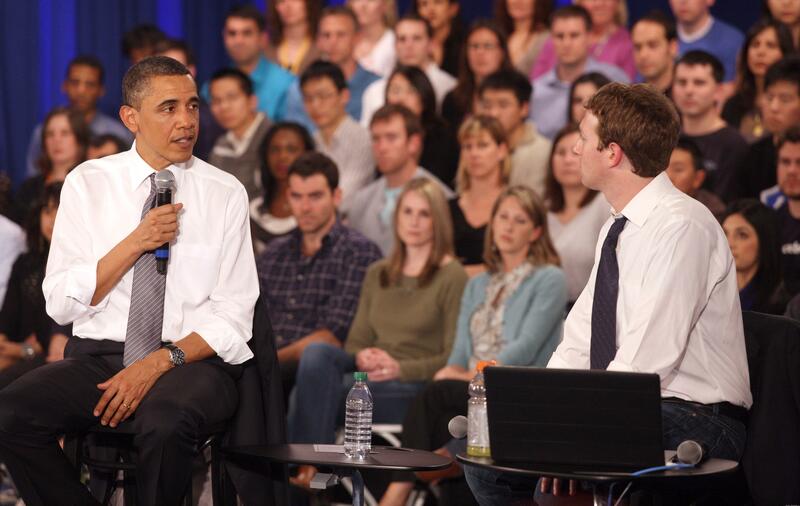 Zuckerberg later presented Mr. Obama with a "Facebook hoodie," which the president declined to put on. The president said at the beginning of the event that he was conducting it because "more and more people, especially young people, are getting their information through different media." "What Facebook allows us to do is to make sure this isn't just a one-way conversation," Mr. Obama said. When Mr. Obama was answering the first question of the event, which came from Zuckerberg, he said high-income Americans -- including the Facebook founder -- should pay more in taxes to help reduce deficits. "I'm cool with that," Zuckerberg interjected. Mr. Obama largely covered familiar ground during the event, touching on issues like immigration, education and health care. He criticized the GOP's budget plan as one that "is fairly radical" and not "particularly courageous." Mr. Obama said he thinks Rep. Paul Ryan, who designed the GOP plan, is "sincere" and "a patriot" seeking to solve a real problem. Citing provisions of the Ryan plan, Mr. Obama said "some call it bold." He added: "I call it short-sighted." The president's deficit-cutting proposal would cut $4 trillion over twelve years by cutting spending and raising taxes on the wealthy, while the GOP plan,which would cut $6 trillion, includes significant changes to entitlement programs and tax cuts for high-earners. The White House took questions in advance of the event, billed as a "Shared Responsibility and Shared Prosperity" town hall meeting. But as CNET points out, it did not allow the public to vote on which ones Mr. Obama would answer - possibly to avoid being flooded with questions tied to marijuana legalization, as has happened in the past. Instead, Facebook chose which questions the president would answer. Among those who went to Facebook headquarters in Palo Alto for the event were House Minority Leader Nancy Pelosi, who posed for pictures with employees before Mr. Obama's arrival, according to the Associated Press. The town hall, which was broadcast live, was hosted by Zuckerberg and chief operating officer Sheryl Sandberg -a member of the President's Council on Jobs and Competitiveness. Obama far outpacing challengers in Facebook "likes"
Facebook responded to questions about ties between the company and Mr. Obamaby stating that it is "happy to consider other types of non-fundraising visits to Facebook headquarters by political candidates, elected and government officials." It noted that it has hosted former President George W. Bush and Sen. John Cornyn (R-Texas), among others, for live chats. Still, the visit prompted scrutiny of the relationship between the social media powerhouse, which boasts more than 600 million users, and the president, who leads a mere 311 million or so Americans. Facebook spent just $351,000 last year on lobbying, as the Wall Street Journal reports, a paltry amount in comparison to companies like Google and Microsoft, which spent $5.2 million and $6.9 million respectively. The company just opened a new Washington office, however, and hired four new staffers and two lobbying firms in recent months as part of a push to expand its presence in the city. The relatively small expenditure comes even as questions are increasingly being raised about the company's commitment to privacy and how it is handling free speech issues in places like China, where it is considering entering the market. A lobbyist for the company told the Journal that "We are occasionally held in uncomfortable positions because now we're allowing too much, maybe, free speech in countries that haven't experienced it before." Unlike Google and Microsoft, Facebook has declined to join the Global Network Initiative, which seeks "to protect and advance freedom of expression and privacy" in information and communications technology. For Mr. Obama, the visit was a chance to burnish his image among the Internet-savvy young voters who helped him win office in 2008 - though it also means an even stronger association for the company, which could be a liability if it eventually falls out of public favor. For Facebook, meanwhile, it marked a chance to showcase its power as a communications platform. Spokesman Andrew Noyes said in a statement that "We're honored that President Obama is visiting Facebook today and is using our platform to communicate directly with an international audience. More broadly, we're heartened that political figures are using Facebook to organize and reach people in a direct, personal, simple way that was unimaginable a decade ago." The visit comes at the start of a three-day west-coast swing for the president that includes two town hall events -- the other is in Reno, Nevada - as well as six fundraisers for his 2012 reelection campaign. The president will be attending three fundraising events in San Francisco alone - two Wednesday and one Thursday morning, a Democratic National Committee source told CBS News. All proceeds will go to the Obama Victory Fund. The events are designed to include the broad range of the president's supporters, with tickets starting at $25 and rising to the legal maximum limit of $35,800. Hall of Fame wide receiver Jerry Rice will be speaking at one event. Both the DNC and Obama campaign are declining to disclose the amounts raised at individual events.